Constantijn Huygens received the regulations in a letter dated 26 May 1645. Were they disputed by his sons Constantijn Jr and Christiaan, who were students in Leiden and rented rooms at Paravicino’s? Petrus Paravicinus requests the noble gentlemen tenants to subscribe to his laws so that the house may be governed appropriately. 1. The name of God shall be honoured among us, and everyone will take care not to swear, which may amount to blasphemy. 2. No one will cause a fight, yet should someone on occasion do so, I shall ask those who are responsible to report the case to me, so that I may arrange for reconciliation. 3. Whoever will not be in the house at a quarter past twelve, or at half past seven, will no longer be expected for luncheon or supper [respectively], and he shall have to content himself with the leftovers, and whatever food is available in the house. 4. No one will leave the house after supper, unless they have previously informed their tutors or myself, so that I may judge if it is in their interest, and if someone should act otherwise, and something should happen to him, I shall be exculpated from negligence toward their parents. 5. After supper, everyone shall be required to translate a piece from Italian into French, or from French into Italian, but if he has no such inclination he shall not impede the others from making progress. 6. Everyone shall learn a story or other by heart, which he shall recite over luncheon or supper, each to his ability, in one language or the other, and if he should fail to perform this exercise at least once a day, he shall be obliged on each occasion to pay a penny for the poor. 7. On Sundays the Holy Scriptures shall be read with due reverence and respect as a religious exercise, in the hope of obtaining God’s Blessing. The boarders in question were Huygens’s sons Constantijn, jr. and Christiaan, who were students in Leiden since May 1645 and rented rooms at Paravicino’s. Apparently, they had been protesting against these regulations with their punitive measures, and the landlord was seeking support from their father. In his reply, the latter took the side of his sons, ‘for whom a gentle hand and fatherly admonition had always sufficed’. Apart from that, he himself had already supplied them with a rigorous study programme that prescribed how they were to spend their day. This letter is part of the Huygens collection. This collection hails back to 1695, when Christiaan Huygens – shortly before his death – bequeathed a large part of his scholarly papers to Leiden University Library. After 1800 the legacy was furthermore enriched by manuscripts and letters from both Constantijn and his son Christiaan. For over three centuries, many Leiden scholars have made the Huygens family and the Leiden collections the object of their research. Recently, the codices Hugeniani were described in detail by Dr Joella Yoder, in a long-expected catalogue that was published by Brill in May, 2013. 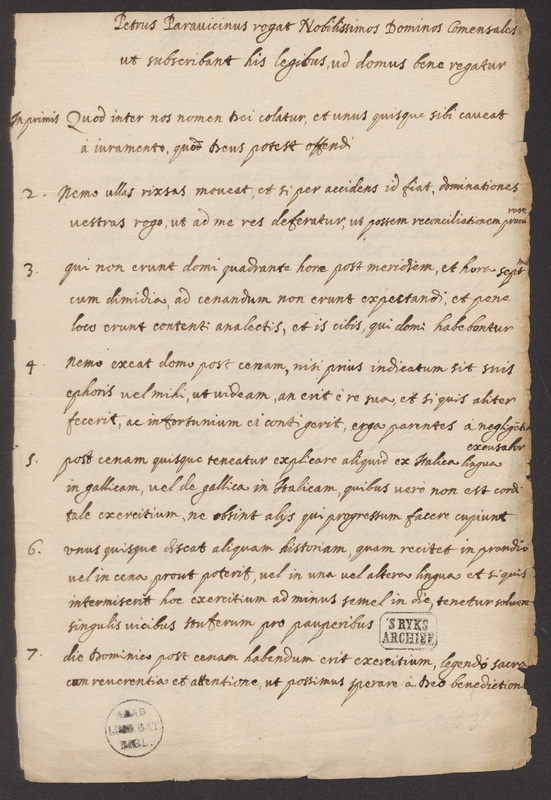 A selection from the original documents may now be admired in the exhibition 'Huygens in Leiden' at the Leiden University Library (24 May – 27 September 2013, during opening hours). This exhibition can also be visited online.